Rome's earliest known inhabitants lived on this hill above the Tiber many centuries before Roman rulers and aristocrats built their grand palaces here. Those palaces, temples, and public buildings reached their height of splendor in the reign of Domitian, and most of what you see today is from that era. But each generation altered and rebuilt, so it is now hard to disentangle the different periods of construction. During the Middle Ages, the splendors of the Palatine fell into ruin as convents and churches - the oratory of Caesarius, Santa Anastasia, Santa Lucia, San Sebastiano - were built over the remains of older buildings, and the noble Frangipani family used them, along with the Colosseum and Arch of Constantine, to create a fortified stronghold. Later, a 16th-century cardinal turned the hill into the Farnese Gardens, incorporating the ruins into a tree-shaded park of terraces, lawns, flowerbeds, pavilions, and fountains for social occasions. The alluring combination of some of Rome's most imposing remains, framed by trees, with views over the Colosseum, Circus Maximus, and other Roman landmarks makes this a popular tourist attraction, especially for those tired of the crowds below. When you walk through the still-impressive ruins of these palaces, temples, and public buildings constructed under Augustus and his successors, you are walking through the history of the Roman Empire. The House of Augustus' wife, Livia, was part of the palace of Augustus and is held to be hers because of the inscription "Livia Augusta" found on a lead pipe in one of the rooms. But Augustus himself may have lived in these apartments. However simple the external buildings were, in keeping with the unpretentiousness of the first emperor, the interior reveals the comfortable lifestyle of the Romans at the time of Christ. The atrium and four rooms show that central heating flowed through ceramic pipes in the walls, and the rooms were decorated with elegant paintings in the Pompeian style, from about 25 BC. These paintings have been moved to a dedicated room at the National Museum of Rome in Palazzo Massimo. North of the House of Livia are the remains of the Cryptoporticus, a semi-subterranean, barrel-vaulted corridor of about 130 meters that linked together the various Imperial palaces, including those of Tiberius, Livia, and the Flavians. Tradition has it that the Emperor Caligula was murdered by conspirators in this corridor in AD 41. Built at the end of the first century for the Emperor Domitian, the Palace of the Flavians was designed to provide a setting for the increased splendor and display, which the emperors now demanded. Around its large, pillared courtyard (peristyle) are the spacious dining-room (triclinium); the throne room (aula regia); a rectangular hall, 30 meters long with an apse at one end; the shrine of the domestic gods (lararium); and a basilica, which probably served as a law court. 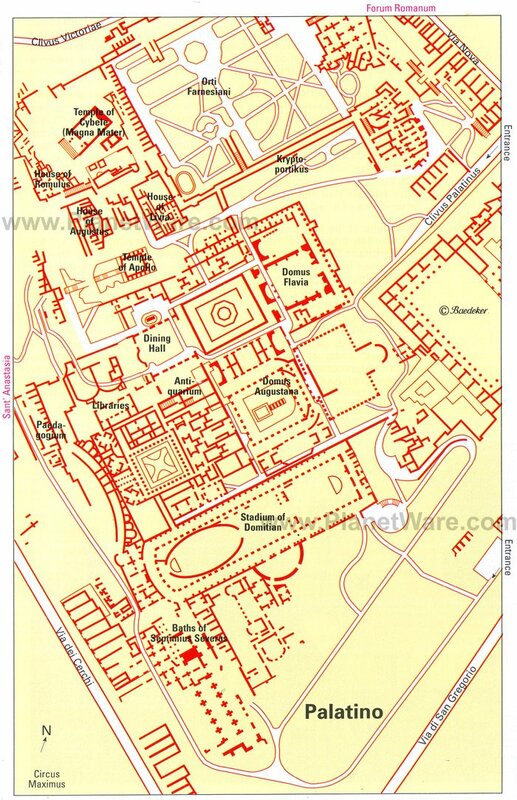 The House of Augustus was at first the residence of successive emperors but later, and into Byzantine times, it served as both residence and offices for high dignitaries of the empire. Excavations continue on the three-story building, built in the time of the Emperor Domitian and among the most impressive sights of the Palatine. Floor mosaics in the courtyard and several rooms have been uncovered, and conservation efforts are bringing extensive wall paintings back to life. Here, more than any other place in the Palatine, you'll get a sense of what life was like for these privileged Romans. Among the main buildings erected by Domitian on the Palatine between AD 81 and 96 was his stadium, a running track 160 meters long and 47 meters wide. It is not known whether the public viewed the contests and displays here or whether it was reserved for the entertainment of the emperor and his personal guests; in fact, it is not even certain that it was actually used for sporting contests at all. It may have simply been a garden designed in the form of a stadium. According to tradition, St. Sebastian was martyred here at the order of the Emperor Diocletian, in whose army he served. The remains of these baths are the most imposing ruins on the Palatine, their piers and arches supported on massive substructures, which have survived through the centuries. You can still see remains of the central heating system in some of the rooms and corridors. From the nearby terrace is a beautiful view, especially as the sun sets across the Colosseum and the Baths of Caracalla. On the low ground below it is the Circus Maximus, a huge structure, which could accommodate 300,000 spectators. Some later palaces were built with terraces extending from the crest of the hill on posts so the emperors and their guests could watch races and games below in the Circus Maximus. In the museum, you can see marble sculptures and reliefs, including statues, capitals, stone slabs, and architectural details from the imperial palaces, along with other finds from the area. There are also frescoes and other decorations from the palaces and temples, and a famous bit of ancient anti-Christian graffito showing a crucifix with a donkey's head. Exhibits change as more artifacts are discovered in the continuing excavations. The Inn At the Roman Forum: luxury boutique hotel, stylish decor, complimentary breakfast, lovely garden, sunny roof terrace. The Fifteen Keys Hotel: 4-star boutique hotel, understated elegance, delicious free breakfast, bikes. Hotel Artemide: mid-range pricing, contemporary decor, rooftop terrace, spa with whirlpool tub. Hotel de Monti: budget hotel, personal service, home away from home, beautiful old building with stairs. Tours of Palatine Hill: Because there is so much to see and such a long history to absorb, a guided visit such as the Skip the Line: Ancient Rome and Colosseum Half-Day Walking Tour can save you time and make your visit far more meaningful. With a group of no more than 25, equipped with headsets so you can hear the guide clearly, you'll enjoy fast-track entry at the Colosseum, Forum, and Palatine Hill as you see the highlights and learn facts that will bring ancient Rome to life. Tickets: Palatine Hill is grouped with the Colosseum and Forum under one inclusive two-day ticket. You cannot re-enter any of these on the same ticket, and unfortunately, the Forum and Palatine are considered one, so you need to go directly between them without leaving the grounds. Access to the House of Augustus and House of Livia requires an additional fee. For Your Comfort: Wear good walking shoes. The hill and Farnese Gardens cover a large area with uneven stones and pathways. Be sure to carry plenty to drink. You can picnic here, under the shady trees, with views over Rome. Getting to Palatine Hill: The Rome Metro Linea B, the Blue Line, stops at the Colosseum, and a number of bus lines from all over Rome stop at Piazza Venezia. All the hop-on-hop-off sightseeing buses stop here as well.